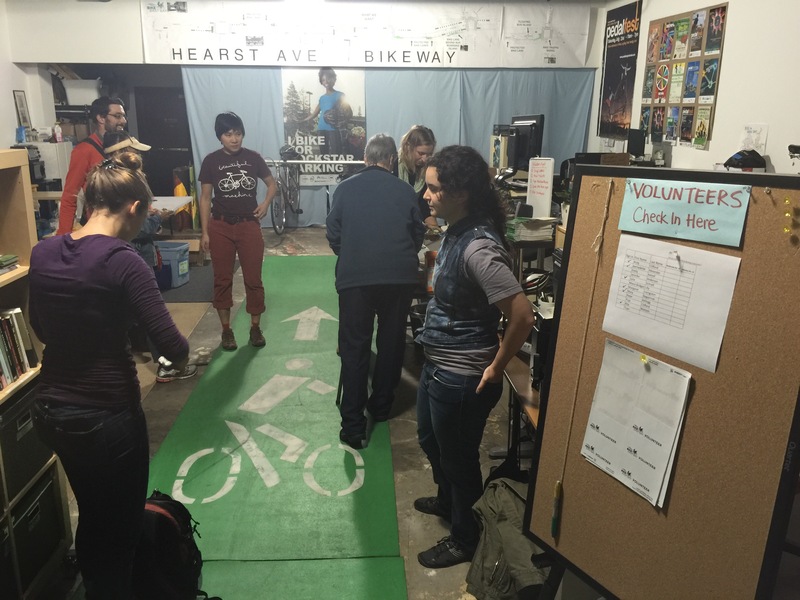 Wonk alert: One of the themes of my tour is to explore the work of bike advocacy groups in CA cities, particularly to learn from the strategies and experiences they’ve had dealing with the pushback to bikeway proposals that they’ve encountered from community groups and others. The following is more technical than my other posts, intended for those interested in this work. 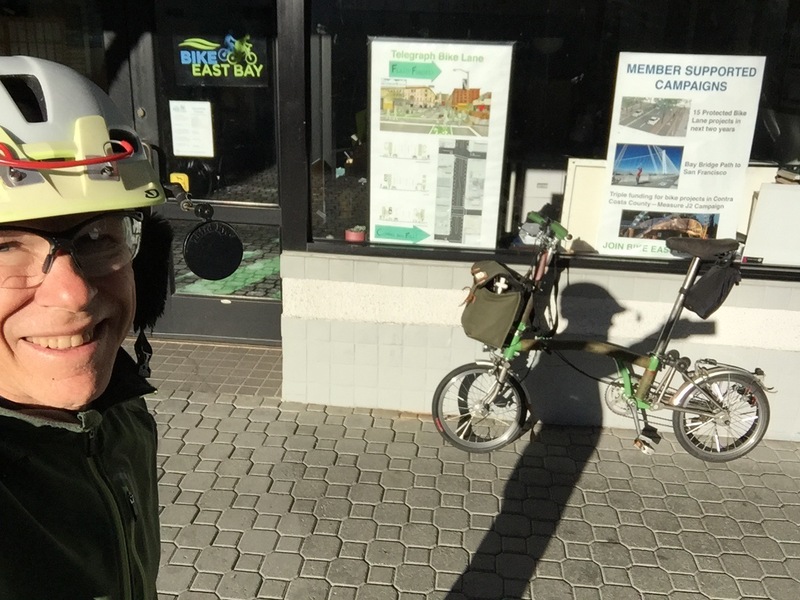 I met recently with Dave Campbell, Bike East Bay’s Advocacy Director (seen above with Executive Director Renee Rivera) at their office on Jack London Square in Oakland. He gave me a rundown of some of their campaigns and strategies. 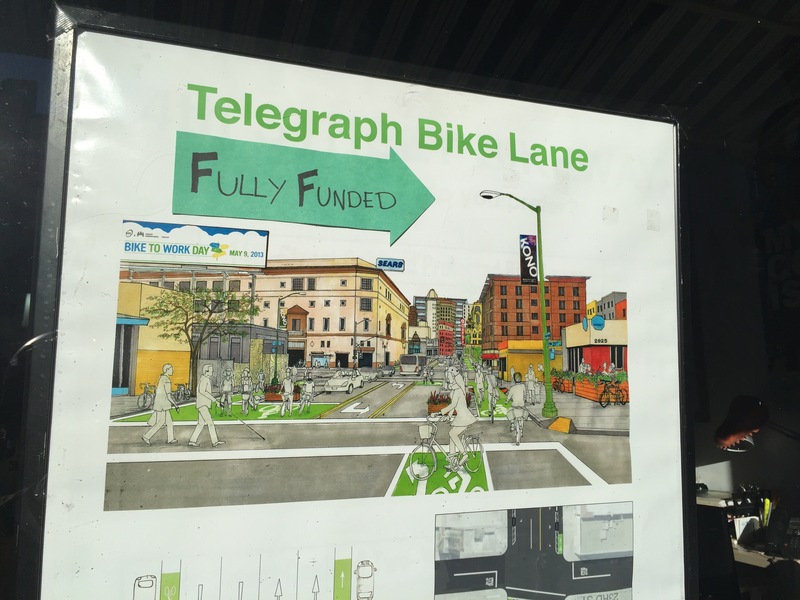 A significant success they have had recently is the approval of the addition of protected bike lanes to a southern section of Telegraph Ave., a major commercial corridor and one with some similarities to the My Fig project in DTLA. The project has been fully funded. 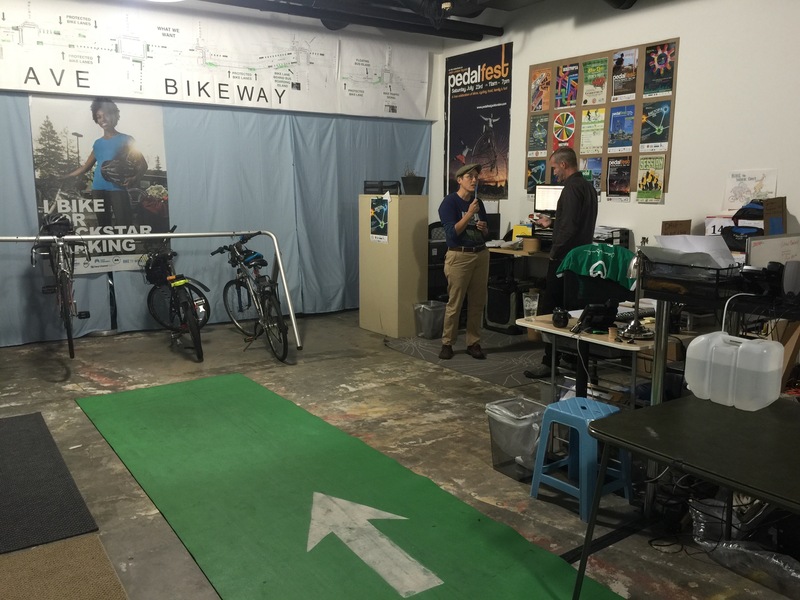 The inclusion of these innovative (for the U.S.) bikeways is the result of some diligent lobbying and collaboration with the city and community, demonstrating how a cordial, persistent, well-informed campaign can change outcomes. The city’s initial plan was for a straightforward lane reduction from 5 lanes to 3 lanes with bike lanes added to the left of curbside parking. 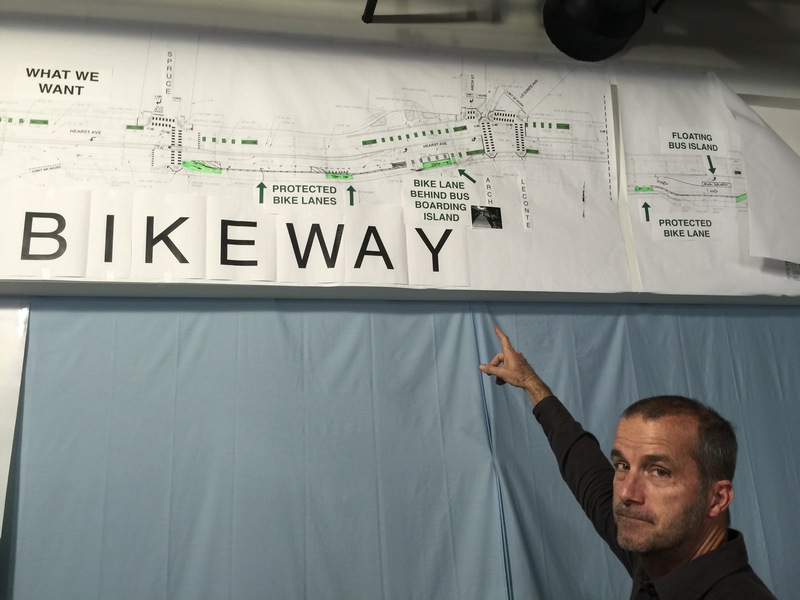 Bike East Bay’s analysis showed that the project actually had the opportunity to create protected bike lanes with the bikeway situated on the right side of parked cars. The city’s initial rejection of the concept might have stopped less informed advocacy efforts. But, drawing on an arsenal of recently approved roadway design documents while developing rapport with city staff, Dave and his colleagues persevered and their proposals gained respect. Another factor that needed to be addressed in the project was the heavy bus traffic on Telegraph Ave. Introducing conventional bike lanes there also meant introducing potential difficulties that can arise when cyclists are stuck behind buses stopped at the curb to pick up passengers. The solution they found was to create bus islands at key stops, routing the protected bikeway to pass behind them (see illustration for Hearst, further below). This will allow boarding to occur without blocking cyclists. An added benefit will be realized by the buses as they will be able to stop in their travel lane and not have to wait to get back into traffic, thereby helping to keep them on schedule. Funding was also found to provide communication between buses and signals so they are able facilitate bus travel with green lights. These two project enhancements served to make the local transit agency a valuable supporter of the new design. 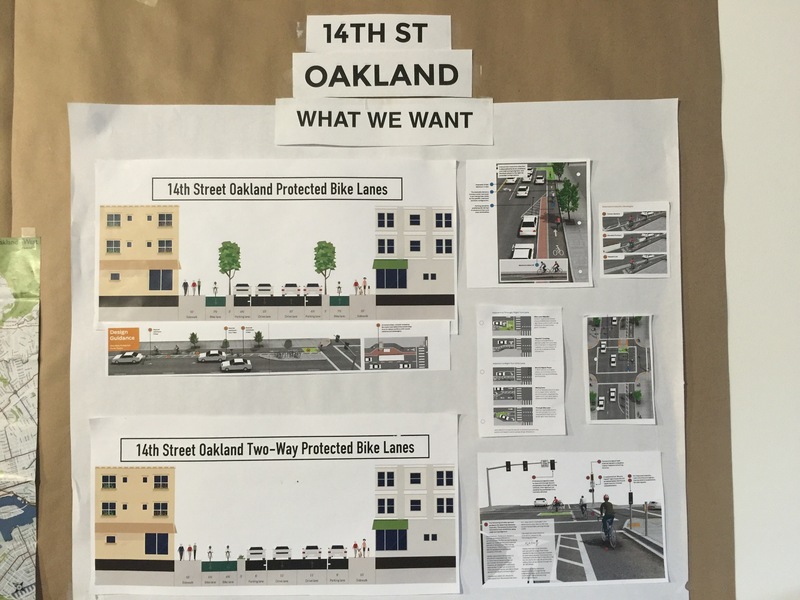 Equally important to getting this project approved was winning the support of the merchants on the street, especially since 18% of curbside parking would be lost, often considered a deal-breaker by businesses. Overcoming merchant objections required extensive door-to-door outreach, meeting with numerous groups and individuals, circulating a petition that was signed by scores of supportive businesses and ultimately winning the support of the local business improvement association. Many businesses were finally convinced when they were able to see a pop-up, one-day demonstration of the new configuration. While the southern segment of the project won the support of a majority of merchants, those in the northern segment remain unconvinced. This district is enjoying more commercial success with lots of new restaurants and shops and and merchants there are not yet willing to take what they perceive as a risk. So the project is being envisioned as two phases, with the southern segment moving ahead and the northern merchants waiting to see how it plays out before deciding whether it’s right for them. Bike East Bay didn’t get the whole project they had sought but this incremental strategy to demonstrate the success in the first phase seems smart to me. 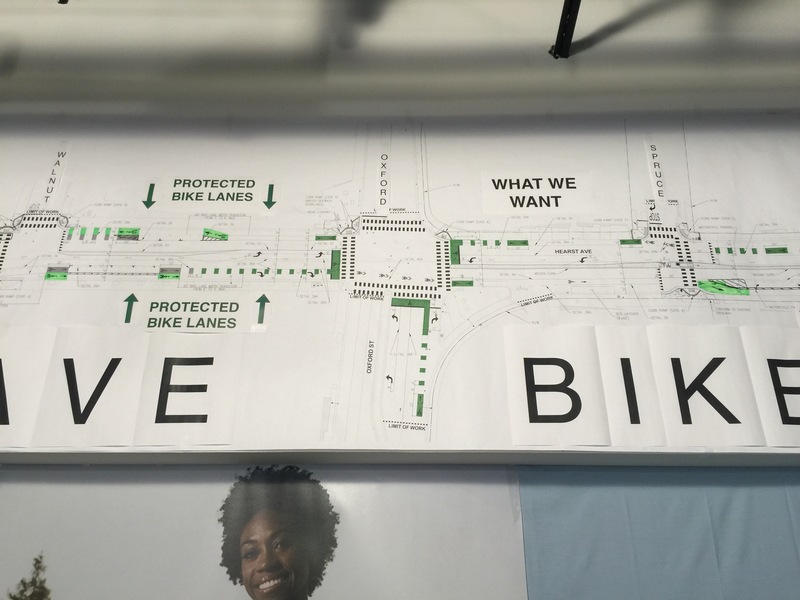 Another protected bike lane campaign that the group has underway focuses on Hearst Ave. For this project they obtained enlarged copies of the city’s concept illustrations and added overlays of the improvements they want incorporated (above). These are used in community meetings to help community members visualize the benefits of their recommendations. Like the Telegraph Ave. project, a pop-up, temporary installation of the recommended features was also created for Hearst. This project would also benefit from bus boarding islands, which Dave is pointing out above. 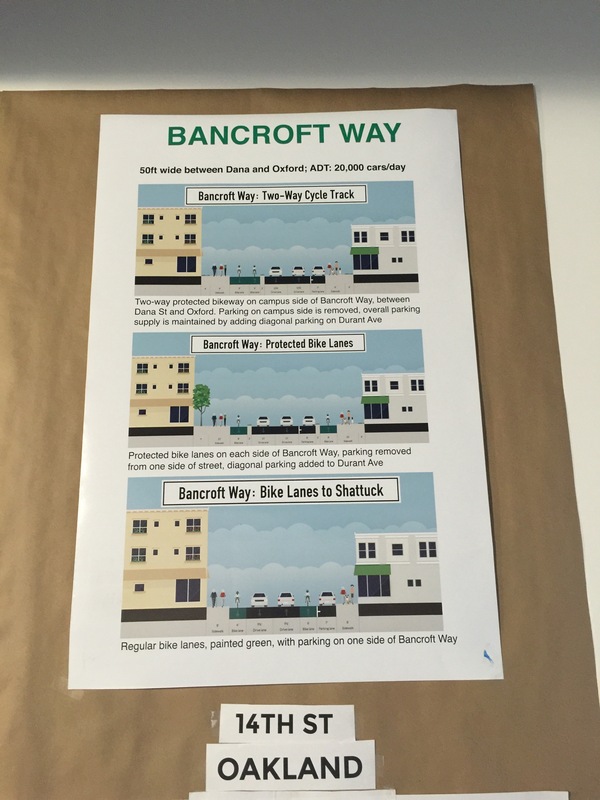 Above, illustrations that Bike East Bay created for their desired improvements to 14th St. in Oakland and Bancroft Way in Berkeley. – Circulate a petition that project supporters sign. It may be necessary to augment the often limited outreach that municipalities are able to do. The petition should be worded carefully so that solutions are not too specific, allowing concerns to be addressed as the design evolves. – Get accident data for the project area to demonstrate the need for improvements. – Create a well-illustrated handout to distribute to community members and decision makers. Include (for instance) crash data, survey results, photo examples of alternative treatments, simple map of project area, traffic data, etc. – Compile letters of support from respected groups and individuals. – Present a list of groups that advocates have spoken to about the project, meetings held, etc. – Insist that the city track the public input they are receiving so they have some tally of numbers for and against. – Concerns about congestion and delays that the project might cause are common but perceptions about delays are often exaggerated. Address these with real traffic counts and delay numbers from similar projects. – Use your membership database to map members who are closest to project and target them for focused outreach. – Get to know opposition leaders. Meet with them to listen, understand their concerns, explain the project better. Stay in touch with them, alert them to steps in the process so they feel included. – Understand who is influencing recalcitrant elected officials by researching who their big donors are. 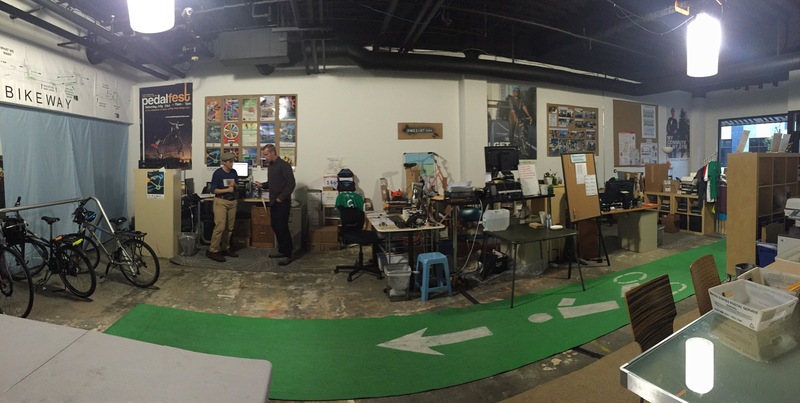 – Do the technical homework, learn what bikeway design practices are being recommended and used elsewhere. Cite recommended designs. Consider supporting or running desired candidates on key boards and commissions if needed for approval. – Obtain drawings of the project area and overlay desired features onto them. As I prepared to leave members were arriving for one of their regular volunteer get-togethers with food and socializing, below.